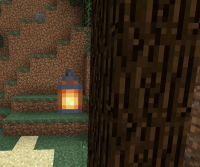 I attempted to place a lantern on the side of a tree, and found that the lantern floated like I placed it on the top of a block. I expected something like the cocoa bean or at least like the mob head, where it hung off the side of the block. I'm not sure that this is a bug, as this just might not be a feature yet, but I'm assuming it should be.